According to a recent study published by the National Highway Traffic Safety Administration (NHTSA), 293 motorists were killed in accidents involving large trucks in 2016. This was the highest number of fatalities over the course of five years, indicating that the number of serious truck accidents is on the rise. In today’s post, we will review five common causes of these accidents and why hiring a truck accident attorney can be beneficial for those who have been injured in these accidents. The Flanagan Personal Injury & Wrongful Death Law Firm provides compassionate and aggressive legal representation to those who have been injured by negligent truck drivers. If you have been injured because of a truck driver’s negligence, you may be entitled to compensation for your pain and suffering. Call (305) 638-4143 today to request your free case evaluation. Cell phones and other electronic devices are common sources of distractions for commercial truck drivers. Taking one’s eyes off the road even for a fraction of a second can have devastating consequences, and many truckers will deny using electronic devices when driving. Thankfully, date- and time-stamped cellular data is admissible in court as evidence of distracted driving. Many truck drivers turn to illegal substances to help them stay awake and maintain their focus because of the long hours that they spend behind the wheel. Drugs and alcohol can cause errors in judgment and slowed reaction times, often causing catastrophic accidents involving innocent motorists. 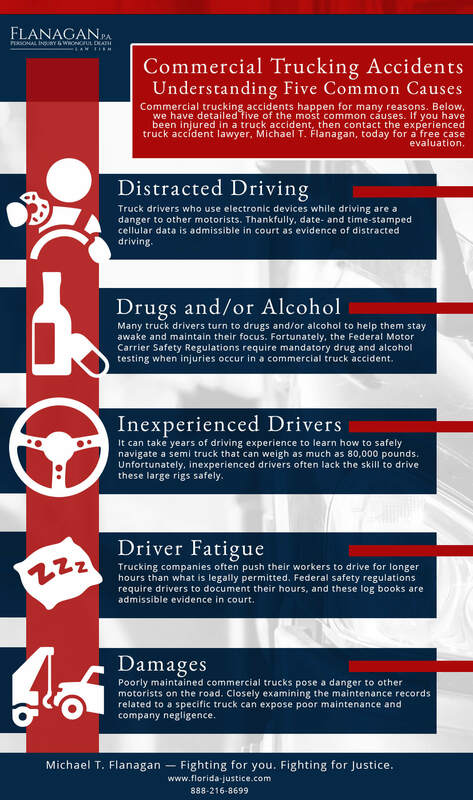 The Federal Motor Carrier Safety Regulations (FMCSRs) require mandatory drug and alcohol testing when there is an accident with a commercial vehicle that results in injury. However, oftentimes motor carriers will claim that the driver was not cooperative following the crash and that they could not obtain a blood or urine sample after the crash. In addition, if the driver was not given a breathalyzer by police, motor carriers will claim that there was no need to test. A fully loaded semi-truck can weigh as much as 80,000 pounds. Safely maneuvering a vehicle so large and heavy requires special skill that can only come through years of commercial driving experience. Because there has been a shortage of commercial drivers in recent years, many companies have chosen to hire inexperienced drivers to ensure increase profitability. Unfortunately, inexperienced drivers often lack the skill to drive these large rigs safely. Even drivers that have been on the road for years can be unfit to drive. There are hundreds of federal regulations that govern the operation of a federal motor carrier and drivers must follow all of these regulations. Without constant refresher courses, education, and training, drivers form bad habits, cut corners, and can cause deadly crashes. In an effort to drive profits and ensure goods are delivered on time, many commercial trucking companies push their drivers to their limits, often requiring them to drive for longer hours than what is legally permitted. This poses an unnecessary risk for both truck drivers and other motorists. To curb this illegal practice, the FMCSRs put a cap on the hours a truck driver can work, and require the use of log books to ensure these caps are not exceeded. However, drivers and motor carriers often falsify their log books to comply with federal regulations. The easiest way to disprove the contents of the log book is to obtain the driver’s cellular phone data, GPS data, and the logbook to clearly prove that the driver’s logbook entries are false. If a commercial truck is not properly maintained, it may pose a safety risk to the public. For this reason, commercial trucking companies are required to keep detailed maintenance logs on each of their rigs. Failure to service essential safety features, such as the brake system, headlights, and turn signals could result in them functioning improperly, which could lead to a serious accident. When a commercial truck driver is involved in an accident, oftentimes, there is a lengthy liability investigation that ensues. During this time, you will be asked for information and evidence to prove your innocence and the extent of your injuries. This can be overwhelming in the absence of proper legal representation, especially if you are severely injured. You may be pressured to settle for your vehicle damage and injury sooner than necessary, and this can prevent full compensation for your loss. A truck accident lawyer can help you through every step of the process, from providing statements to insurance companies to taking the stand in court. An experienced attorney will be well-versed in local and national laws pertaining to commercial vehicles, helping you to build a strong case against the negligent party. Have you or a loved one been injured in an accident with a commercial truck? If so, then you deserve the benefit of being represented by an experienced truck accident attorney. Don’t go up against a large commercial trucking company alone. Contact the Flanagan Personal Injury & Wrongful Death Law Firm today to learn more about our legal representation services for truck accident victims.